During March 16 illegal armed formations shelled Ukrainian militaries' positions in the Donbas 52 times. According to the information of Oleksandr Motuzyanyk, PA spokesperson on ATO related issues, one serviceman perished and two were wounded in action. Lithuania's Minister of Foreign Affairs Linas Linkyavichus got under fire when he was visiting frontline Shyrokyne, the Donetsk region. He informed on his Twitter that the village was shelled from prohibited 82-mm mortars. Krasnoarmiysk authorities ask Verkhovna Rada to rename the town and give it the name Pokrovsk. The decision was made at the session of the town council on March 17. Mayor Ruslan Trebushkin says that this name is supported by 40% of Krasnoarmiysk residents. Passports of the illegal “DPR” grouping are distributed on the occupied territory. “DPR head” Aleksandr Zakharchenko claims that these passports have been recognized by Russia. However, Russian laywers say that new documents will not be legal. People have been said at the Russian border that they will not be allowed to get to Russia with these documents and other “DPR” papers. A car accident involving representatives of the International Red Cross Committee happened in the centre of Donetsk. Two employees and two people who were in another vehicle were injured. Cabinet of Ministers of Ukraine included coal from the Donbas occupied territories into the plan of coal consumption. According to Vadym Chernysh, Chairman of the Sate Agency for Donbas Restoration, imported coal is more expensive that the coal from ocupied territories. This is the reason why coal supplies from the occupid territories were considered while assessing the demand for coal in Ukraine. Donetsk filter station resumed its work (it had terminated its work on March 13 due to shellings). Aleksander Hug, Deputy Chief of the OSCE Special Monitoring Mission, says that currently, none of the conflict parties controls the territory of the filter station. The local election in the separate districts of the Donetsk and Luhansk regions should be held in accordance with the Ukrainian legislation and OSCE principles. This is the statement which was once again made by Angela Merkel, Chancellor of Germany and François Hollande, President of France, after their meeting with Petro Poroshenko, President of Ukraine. The politicians also supported reforms conducted in the country. 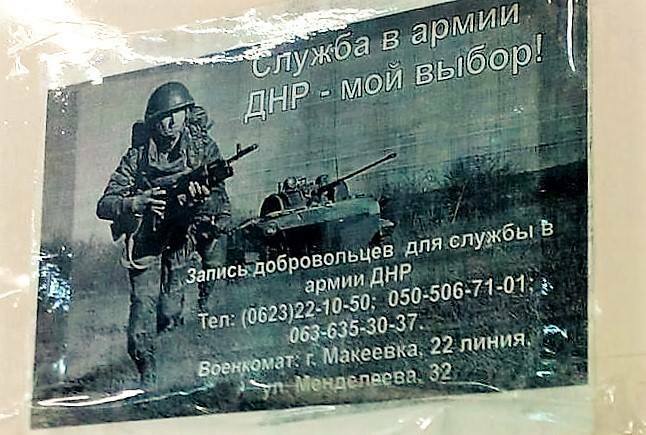 There are advirtisements offering volunteers to join the “DPR” army in supermarkets and shops of occupied Makiivka. There are contact telephone numbers and volunteers can address the military enlistment office directly as well.